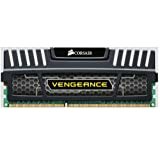 Since the Vengeance -8GB DDR3 Memory Kit by Corsair is out in the market, people love it like anything. If you have ever overclocked your computer, you would know that the Vengeance series of DRAMs are designed for stability and are backed by Corsair’s limited lifetime warranty. Corsair claims every single piece to be factory tested before it reaches to you. These memory kits by Corsair come in so many colors so that they can match your components and your system looks good and visually appealing. The memory kit has been optimized for compatibility with all the latest motherboards and CPUs and supports the Intel Extreme Memory Profile standard. Each module is factory-programmed with an XMP profile indicating the supported frequency, timing, and voltages. Installing it is very simple as well. All you have to do is enable XMP on any compatible motherboard, and without having to modify any BIOS settings, you will be able to achieve optimized memory overclocking. If you aren’t new to overclocking, you may as well achieve eve higher performance, by adjusting the settings accordingly. If you are an enthusiastic gamer, you can push your gaming experience to the maximum limits using it. The individual screening also ensures that there is enough headroom for safe and stable overclocking. It has a 240-pin configuration of memory. Open the computer case, replace your old memory or add to it. If your heat sink is Thermaltake Frio, you may have some problem with the height of the memory. This kit delivers excellent performance, and runs at a lower voltage than many other kits, at 1.5V. The lower voltage allows you to increase the voltage which enables optimizing the memory. Make sure that you do not overclock beyond the limits. The only real issue that you may have with the Corsair Vengeance 8GB DDR3 is that it comes with large heat spreaders, which may get in way with you CPU cooler. You are more likely to face this problem if you have two kits installed. It delivers great performance, looks stylish, comes with a lifetime warranty, and all this at such a reasonable price. It is simple to install and use. What do we not like about it? Corsair Vengeance 8GB DDR3 doesn’t pose any serious problem, but then to name a con, we would mention that the heat spreaders might create a problem with your CPU coolers. Just grab it! This amazing memory kit by Corsair is worth every penny. At a cheap price, it is a great deal as it comes with low voltage and a lifetime warranty. Moreover, it carries the brand name of Corsair, so this memory kit is definitely not going anywhere for ages.